In the fourth of the Federalist Papers, published in 1787, John Jay warned of absolute monarchs who “will often make war when their nations are to get nothing by it.” More than two centuries later, are single executives making unilateral decisions any more trustworthy? And have the checks on executive power, so critical in the Founders’ drafting of the Constitution, held? These are the questions Louis Fisher pursues in this book. By examining the executive actions of American presidents, particularly after World War II, Fisher reveals how the Supreme Court, through errors and abdications, has expanded presidential power in external affairs beyond constitutional boundaries—and damaged the nation’s system of checks and balances. Supreme Court Expansion of Presidential Power reviews the judicial record from 1789 to the present day to show how the balance of power has shifted over time. For nearly a century and a half, the Supreme Court did not indicate a preference for which of the two elected branches should dominate in the field of external affairs. But from the mid-thirties a pattern clearly emerges, with the Court regularly supporting independent presidential power in times of “emergency,” or issues linked to national security. The damage this has done to democracy and constitutional government is profound, Fisher argues. His evidence extends beyond external affairs to issues of domestic policy, such as impoundment of funds, legislative vetoes, item-veto authority, presidential immunity in the Paula Jones case, recess appointments, and the Obama administration's immigration initiatives. 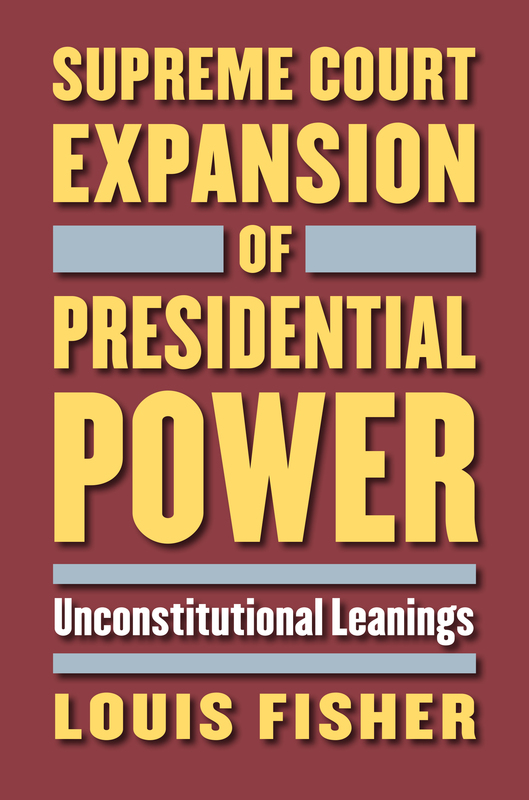 Fisher identifies contemporary biases that have led to an increase in presidential power—including Supreme Court misconceptions and errors, academic failings, and mistaken beliefs about “inherent powers” and “unity of office.” Calling to account the forces tasked with protecting our democracy from the undue exercise of power by any single executive, his deeply informed book sounds a compelling alarm. Louis Fisher is scholar in residence at The Constitution Project in Washington, DC, and visiting scholar at the William and Mary Law School. From 1970 to 2010 he served in the Library of Congress as senior specialist in separation of powers at Congressional Research Service and specialist in constitutional law at the Law Library. His many books include Constitutional Conflicts between Congress and the President, Sixth Edition, Revised; Presidential War Power, Third Edition, Revised; and Military Tribunals and Presidential Power, winner of the Richard E. Neustadt Award.